Imported EKG pellet hops. 4 - 6% AA. Sweet, spicy, floral, with earth and thyme overtones. 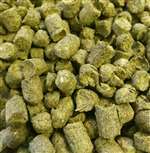 Used as a dual purpose hop extensively in English and Belgian beers. Use Fuggles as a possible substitution. Get the latest updates and exclusive promotional offers. Sign up now! Connect with us on Facebook and Twitter for the latest news and special offers!